HÀ NỘI — Prime Minister Nguyễn Xuân Phúc has agreed in principle to the organisation of a forum on sustainable and climate-resilient development of the Mekong Delta in October 2019. He has asked the Ministry of Natural Resources and Environment to coordinate with the ministries of Agriculture and Rural Development, Planning and Investment, Finance, Construction, Transport, Home Affairs, and Information and Communications, and relevant agencies to decide on the forum’s theme and prepare the agenda. The work must be reported to the PM in February 2019. The Mekong Delta makes up 12 per cent of the country’s natural land and 19 per cent of national population. As the country’s largest agricultural production centre, the region contributes half of Việt Nam’s rice output, 65 per cent of aquatic products and 70 per cent of fruits. The region accounts for 95 per cent of the country’s rice exports and 60 per cent of total overseas shipments of fish. However, 38 per cent of the Mekong Delta region is at risk of being underwater by the 2100, with some parts of the coast facing erosion at a pace of 30m each year, according to official studies. 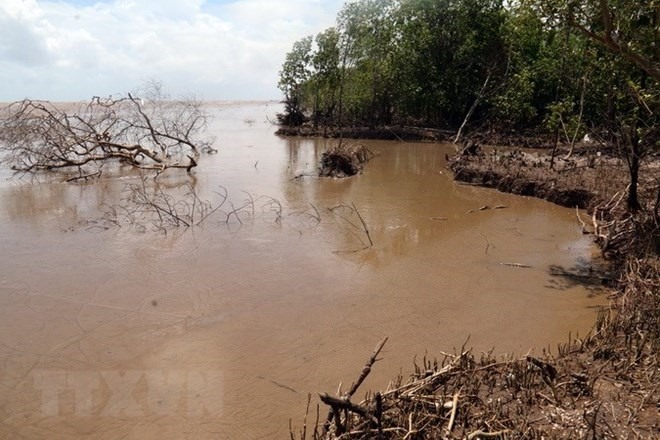 Furthermore, the protective mangrove forests are in considerable decline, and the intrusion of saltwater into ground water is becoming a serious problem as it damages the fertile soil for agriculture. In addition, human activities in the region, such as clearing coastal forests, altering natural waterways, and adopting intensive agriculture and aquaculture practices, are threatening the ability to provide essential ecosystem services in the Mekong Delta. Last year, Prime Minister Phúc signed a resolution on sustainable development of the Mekong Delta as part of an effort to cope with climate change. Under the resolution, by 2100, the region’s sustainability would be ensured with high-quality agriculture, eco-tourism, services and industry, especially the processing industry. The latter would increase the value and competitiveness of the area’s agricultural products. The infrastructure system of the delta would also be greatly improved by that time. By 2050, the Mekong Delta will aim to become a region with "moderately good development and a modern social organisation level", according to the resolution. By that time, the income per capita of the delta would be higher than the national average, while the proportion of ecological agriculture and high-quality applied agriculture would reach 80 per cent. Besides ensuring prosperity for local residents, sustainability would require the preservation of traditional and special cultural values, and protection of land and water, according to the resolution.